At our Scottsdale, AZ Hearing Center, we love helping our patients have happier hearing. Work with one of our wonderful audiologists to learn about the variety of hearing aid options and treatment options available for better hearing. Our audiologists provide treatment for tinnitus. We also work with a variety of hearing devices including cochlear implants, bone anchored hearing aids, and traditional hearing aids. Our Audiologists stay up to date on all of the latest hearing technologies and have studied for many years to provide the highest quality Audiology services in the Scottsdale area. Hearing tests (hearing evaluations) are different than hearing screenings. 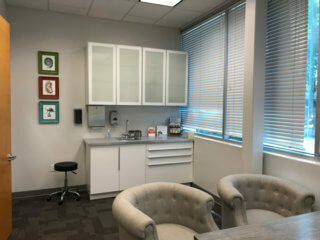 When you come to our Scottsdale Hearing Center, we will go through your hearing history and ask detailed questions about your medical history as well as your lifestyle. We will use a lighted video otoscope to inspect your ears for abnormalities and also check for cerumen or wax blockage. Our video otoscope allows us to show you what we see when we are looking in your ear canal. Our Doctors of Audiology will perform a thorough diagnostic hearing evaluation in a soundproof booth to determine not only the shape of your hearing loss but the type of hearing loss you have, which is incredibly important in determining your treatment options. We test newborns through adults. Testing for children is done in a playful environment and most of the time, the child does not even know they are having their hearing tested. Hearing aid evaluations can be combined with hearing tests, but may also be separate consultations if you have had your hearing tested elsewhere. A hearing aid evaluation allows us to look at your hearing loss and type of hearing loss and determine if hearing aids, bone anchored hearing devices, or a cochlear implant would best suit your hearing needs. We work with multiple hearing aid brands in our other hearing centers and Scottsdale is no exception. Some of the major brands are, Phonak, Starkey, Oticon, Widex, Signia, Unitron, Hansaton, ReSound, Rexton, and Sonic Innovations. Having affiliations with multiple hearing aid brands from multiple manufacturers allows us to treat all types of hearing loss in all price points. Pricing and technology are variable between manufacturers, which allows us to treat everyone’s hearing loss and find something that works with their individual budget. Since we work with all of the top manufacturers we carry most hearing aid parts. If we are unable to repair your hearing aid, it’s likely that we can facilitate a warranty exchange. Typically, most hearing aid repair can be done while you wait at the Scottsdale office. Bone-anchored hearing aids are for individuals who may not benefit from traditional hearing aids. Bone-anchored hearing aids send the sound signal through the bone by bypassing the middle ear. Bone-anchored hearing aids work for individuals with single-sided deafness, individuals with middle ear trauma, or those born without an outer ear. Cochlear implant evaluations are a lot like traditional hearing evaluations, however, more extensive testing is done. Hearing testing includes audiometry, testing in background noise, and aided testing (meaning that hearing aids are worn during the test). These test results allow us to determine if hearing aids are truly benefiting the patient, or if they no longer amplifying enough to hear speech clearly. If you suspect hearing aids are no longer working for you, a cochlear implant evaluation may be the next step. 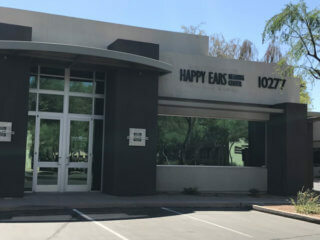 Happy Ears Hearing Center offers cochlear implant mapping services in our Scottsdale location and others. Cochlear implant mapping occurs when we re-program the cochlear implant processor. Much like having hearing aids adjusted, cochlear implants need to be adjusted due to changes in the auditory system. Our audiologists currently map Advanced Bionics and Cochlear products. Many individuals experience cerumen (wax) buildup in their ears. Cerumen protects the ears, however, when built up, it can affect your hearing. If your ears produce too much wax, it can create a wax plug that can also impair your ability to hear. For help with cerumen/wax buildup, contact our Scottsdale Hearing Center or any of the others. Our audiologists are highly trained in cerumen management and will safely remove any wax plugging your ears. Many people suffer from ringing in the ears. Some people also describe tinnitus as crickets, the ocean, buzzing, clicking, or humming sounds. If you have any of these symptoms, you are experiencing tinnitus. Tinnitus is described as an awareness of sound that is not caused by an external noise. Tinnitus can trigger anxiety and depression and can affect relationships, employment, and regular everyday activities. Many people notice tinnitus more when the environment around them is quiet. If you experience tinnitus or feel that it is creating a negative effect on your life, contact our Scottsdale Hearing Center and our Doctor of Audiology can evaluate your tinnitus and explain the treatment options available. While there is no cure for tinnitus, there are various treatment options that do help reduce the symptoms. Many hearing stores and practices only offer one option to treat your hearing. In many cases, it is because they are owned by, or incentivised by a single manufacturer. However, just like hearing loss, not all treatment options are the same. Some devices are better than others depending on your unique type of loss and the lifestyle you want to lead. After being deaf in my right ear for over 20 years, it is wonderful to be able to use the cros hearing aid to help me have the sensation of hearing again. My balance has improved and the tinnitus has reduced by half! 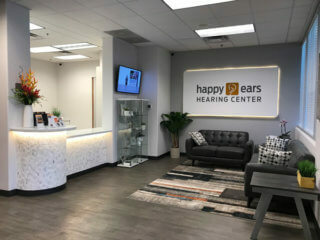 The staff at Happy Ears Hearing center is great and extremely knowledgeable.